You might be thinking I made a mistake writing about digestion and the skin, but its no mistake. Digestion, or how we intake, process, absorb and excrete food, plays an enormous role in healthy skin. We quite literally ARE what we eat, and the result of what we eat shows up on our skin. The digestive process is a very complicated discussion, one that I am no expert on, so we won’t go there. The skin however, is another story. Here’s the thing. You need to eat nutrients to build a healthy skin and body. Nutrients like essential fatty acids, vitamins, minerals, and proteins are abundant in a whole foods diet. Notice that sugar, carbohydrates, artificial colors and flavors are not on that essential list. START WITH REAL FOOD. Nuff said. Once you have eaten something yummy like dark green leafies, salmon, blueberries, or pastured butter, your body needs to digest and absorb that nutrition. If you don’t digest well, you can’t access those nutrients. If you have increased intestinal permeability AKA Leaky Gut, you can’t absorb those nutrients either. Unless you live off the grid or under a rock, you’ve probably heard the term “microbiome”. It refers to the collective population of microbes living in and on our body, skin included. It appears that certain gut flora play a BIG role in inflammation, which is known to be a major player in skin issues. Curiously, there is some recent research that indicates systemic inflammation may actually be COMING FROM the skin! In other words, taking good care of your skin will keep you from aging. There is a ton of research underway on the microbiome now, so hopefully we will learn more in the next few years. Taking bitters like dandelion, yellow dock, or artichoke before meals. Among other things, bitters stimulate bile production, helping fat digestion. Dandelion IS A SUPERFOOD!! Eat in a relaxed environment. Seriously! You’ve heard the phrase Fight or Flight? The opposite is Rest and Digest. You don’t actually digest your food unless you are in a relaxed state. Slow down and chew your food for Pete’s sake! Drink bone broth. For real. Its way more than just chock full of collagen, which happens to be super trendy in skin care right now. Its also filled with easily digested amino acids that may help to repair a leaky gut. Clients have asked me for years what is the best food to eat for healthy skin. BONE BROTH. There, I said it again. Eat an anti-inflammatory diet. Google it. Eat healthy fats like avocado, fresh flax seeds, walnuts, coconut oil (eat it, don’t wear it), pastured butter and pastured meats. Just eat real food #jerf. If you need help with your digestion, see your doctor. If you need help with your skin, see us at Viriditas Beautiful Skin Therapies in Providence, RI. It cured my dry skin! It made me lose 20 pounds! Now don’t get me wrong, I love coconut oil, for cooking. Its a healthy saturated fat, has a nice mild flavor, and I adore putting a dab in my roasted carrots, and its not bad in a bulletproof coffee either. But it is NOT, I repeat NOT the most wonderful substance since sliced bread for your skin. Especially if you are acne prone. See, all oils are made up of fatty acids. There are lots of different kinds of fatty acids like linoleic acid, alpha linoleic acid, eicosapentaenoic acid(EPA), docosahexaenoic acid (DHA), oleic, myristic, lauric etc. Its complicated, but suffice it to say that if you have too much of one, or not enough of the others, the barrier breaks down and the skin can’t do its job. Chaos ensues in the form of redness, itching, irritation, stinging, dermatitis… you get the point. Here’s the problem: Coconut oil is made up of ALL FATTY ACIDS. All vegetable oils are made of fatty acids. Used alone, coconut oil can damage the skin barrier over time. Pro tip: mature skin needs more cholesterol, but there isn’t any in coconut oil! Coconut oil is made up of 46-50% Lauric acid, and 17-19% Myristic acid. Lauric acid is HUGELY comedogenic. It also has some pretty strong antimicrobial properties, which is why people use it for acne. Myristic acid is comedogenic as well. The catch is, it takes 3-6 months for a comedone (blackhead) to form. So sure, your red pimples may look better, but they will come back with a vengeance in 3-6 months. Trust me on this, as an Acne Specialist I’ve seen it happen soooo many times. When people say that coconut oil “cleared” their acne, its possible that they didn’t actually have ACNE, they may have had a look alike such as rosacea or folliculitis. The lauric acid in coconut oil may have been helpful for them, because there is a strong microbial component to these issues. It blows my mind that bloggers, Health Coaches, skin care professionals, and even doctors are still saying that coconut oil is great for the skin. It’s just not true. Its what I call Blogger BS. Bottom line is don’t use coconut oil by itself to moisturize your skin, and most definitely DO NOT USE IT IF YOU ARE ACNE PRONE. For more info or to get your very own skin care specialist, visit us at Viriditas Beautiful Skin Therapies in Providence RI or give us a call 401-632-4444. Those annoying little dark specks that seem to fill our pores and drive us to distraction when we look in those big magnifying mirrors are technically known as comedones. So are they really a problem? They can be. They can stay relatively small, or they can grow to unsightly size. Most of the time they are just a cosmetic inconvenience, but they can stretch the follicle, creating a permanent scar. They can also become a comfy home for the bacteria responsible for acne. It takes 3-6 MONTHS for a comedone to form. You may notice a whole new crop sprout up seemingly overnight, but they’ve been brewing for months. Skin cells shed at a rate of 1-2 cell layers daily. If you have acne prone skin you may shed 5-7 layers daily. That’s a lot of skin cells collecting in those tiny pores. Oil refers to the rich lipid complex that makes up sebum, your skin’s natural lubricant. It can also refer to the oils, butters and waxes that are found in your skin and hair care products. Debris is the collective term for other “stuff” like bacteria, environmental pollutants, dirt, makeup and general yuck that lives on your skin. When the debris and skin cells get stuck in the oil, they form a thick paste that can eventually harden. If the opening of the follicle (pore) is wide enough, the surface of this plug may oxidize or turn a dark color. Its a lot like how the cut surface of an apple turns brown. If the opening of the follicle is very small or tight, this plug forms a closed comedone, AKA a “whitehead“. Many people refer to a papule or a pustule (actual pimples) as a whitehead, but now that you have read this blog, you are among the chosen few educated skin care connoisseurs that know the correct name. That’s because YOU are AWESOME. There are a few lookalikes that may be mistaken for comedones. Most common are sebaceous filaments. These are often sprinkled liberally across the nose and forehead. Annoying as they are, they are NOT blackheads. They are actually like tiny wicks in the pore, and serve to help bring sebum to the surface. Typically when you use a “pore strip” and peel it off to see all those “blackheads”, you’re really just seeing lots of sebaceous filaments. Those strips can be strangely satisfying, but they aren’t really removing blackheads. Sometimes moles and skin tags can be mistaken for comedones too. 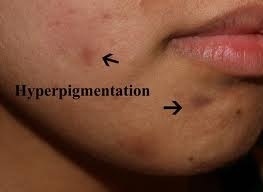 If you really want to remove blackheads / comedones, see a professional esthetician. That’s something we specialize in. If you are in the Rhode Island area, come see us at Viriditas Beautiful Skin Therapies or call 401-632-4444 and get rid of those pesky blackheads today. Acne….dun dun dunnnnn (cue the scary music)… No one wants to wake up with a giant honking red ZIT on the end of their nose, but some of us are just blessed that way. 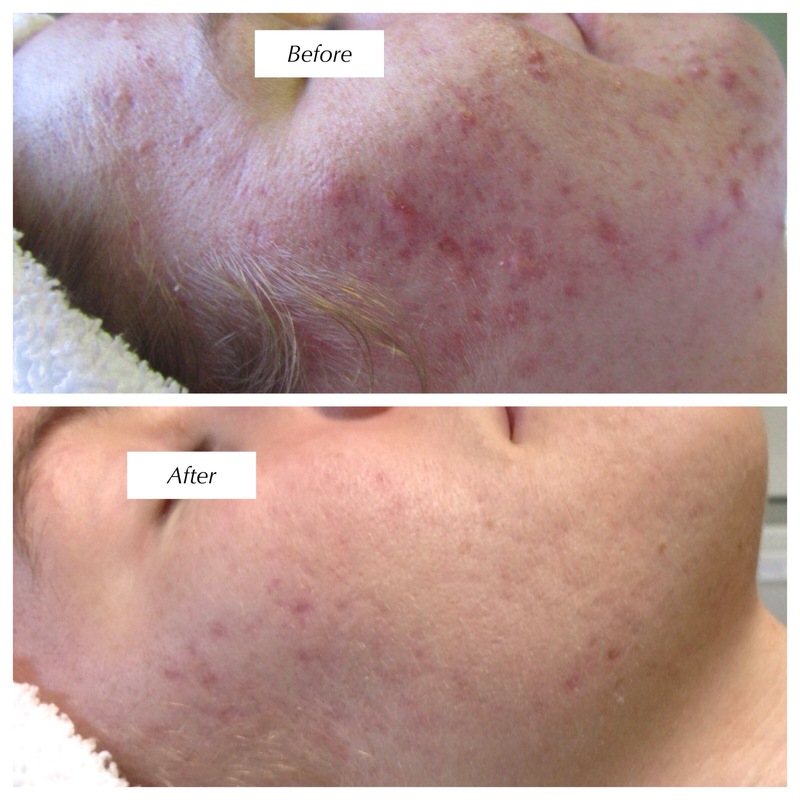 Unfortunately, acne can occur at any time of life. In fact, a large number of clients we see for acne are menopausal women, and young men in their 30s. Acne is technically an inflammatory skin disease, and can be painful, itchy, swollen, and maddeningly difficult to heal. It tends to reoccur with some regularity, like an unwelcome house guest. True acne will have comedones AKA blackheads, which may or not be visible. The classic pimple may be tiny or large and cystic. They may have a pustule or they may simply be a painful nodule. Its important to rule out other conditions, so that your treatment protocols are the most effective. Retention Hyperkeratosis– AKA “sticky skin” a condition where the skin cells don’t shed properly: they shed too fast, in large sheets. Excess Oil – both the quantity and consistency of natural sebum will affect this, in addition to comedogenic ingredients found in skin care, hair care, makeup and other personal care products. Many comedogenic ingredients ALSO contribute to Retention Kyperkeratosis. Bacteria– the C. acnes bacterium actually contributes to the oil production and the inflammation. Each one of these is related and overlaps with the other, making for a challenging puzzle. Acne CAN be controlled, but it does involve a commitment to yourself. Our skin is a reflection of our bodies health, and our health starts with our gut. the connection between the skin and gut is becoming clearer every day. So much research is being conducted on the gut microbiome, and its association with the skin microbiome. After all, its really the same surface, one is outside, one is inside. Often referred to as “bacne” (! ), acne affecting the back and chest respond to the same products used for the face. Because the skin on the body is thicker, it can tolerate stronger concentrations. Remember Pimples = Oil + Dead Skin + Bacteria + inflammation. To effectively banish blemishes, you need to address all four. Salicylic acid: a beta hydroxy acid (BHA) that has the very cool ability to penetrate oil, meaning all those little blackheads made up of oil, dead skin and bacteria! A cleanser with salicylic acid or mandelic acid can be a big help in keeping blackheads at bay. Mandelic acid is the latest skin care darling when it comes to acne! Derived from almonds, it can effectively exfoliate, kill bacteria AND reduce the dark spots left from blemishes gone bad, otherwise known as hyperpigmentation. See below for an example. The Holy Grail for acne clearance is without question benzoyl peroxide (BPO). It penetrates and opens clogged pores, kills bacteria and is the bomb at keeping new blemishes at bay. It is best as a leave on treatment, but can also be helpful in a wash for preventative care. A note about BPO however, skin will typically develop a resistance to it’s pimple busting powers, so you may need to gradually increase the strength and frequency of application to get full clearance. It can cause dryness as well, and good BPO may bleach your sheets, so wear a white t-shirt while using it. Some bacne can be really resistant, so a few helpful “heavies” include sulfur and retinol. Sulfur can be immensely drying, but sometimes is THE game changer for really inflamed bacne. Be aware that sulfur and sulfa (drugs) are two totally different things. Many people are allergic to sulfa drugs, but sulfur is a naturally occurring element, found in many foods (garlic, onions, cabbage). Retinol is amazing for helping to clear acne, smooth and refine skin texture, banish signs of aging, etc. However, I feel retinol is most effective AFTER most of the inflammation is down. Retinol works by speeding up cell turnover, so it can literally bring up or “purge” blemishes. If there is rampant inflammation, acne can look way worse before it gets better. If a client is ok with that, then we go for it! Blemishes (oil + dead skin + bacteria + inflammation) typically take about 3 months to develop. Research has shown that the inflammation is often present way before a blemish even appears. This would indicate systemic or chronic localized irritation. Think DIET!! Watch out for dairy( yogurt, ice cream), high-glycemic foods (sugar, grains, empty carbs) and high iodide content (mmm tortilla chips, salt licks lol). The big painful, red inflammation part can happen overnight. If you ice the inflamed area for a minute or two before you put your treatments on, you will hasten the clearing. When you are ready to FINALLY get clear, look me up! Don’t live near Providence? I got connections baby…hit me up and I can put you in touch with an acne specialist closer to you!